If you are looking for more than just one game to enjoy, the triple threat provides billiards, air hockey and table tennis family fun - all in one table. We all know your kid's game rooms can quickly become cluttered with toys they aren't using in every corner, which is why these multi-game tables are the perfect fit. Obviously, you sacrifice some quality in table construction and design when you buy a 3-in-1 table. However, the advantage is if the kids get bored playing ping pong, simply change the top and get down on a game of air hockey or pool. Hathaway's easy-latch locking system makes flipping the table to change games easy. 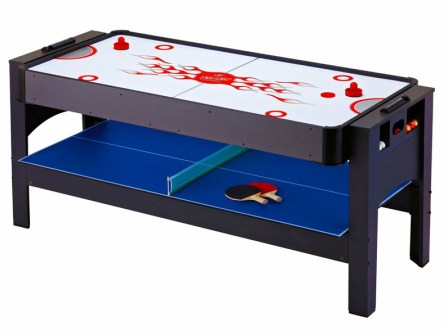 The table is made of high quality MDF wood and comes with all the accessories to play the 3 games. This table is priced at about $460 US.